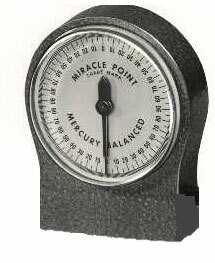 Miracle Point Flat Magnetic Base Protractors by Cullen Legois Mfg Co. Inc. This accurate protractor has an extremely sensitive, balanced needle which gives immediate reading of angles for 360 degrees. The flat base exerts a powerful magnetic pull. Determining angles on shapers, milling machines, grinders, welding applications, etc. Indispensable in quickly and accurately determining angles. Checks drive line angles and many other uses.